For her tiny size, Belize has a wealth of natural and cultural resources to offer travelers whether it be an easy beach vacation on one of Belize’s cayes, an exploration of Belize’s multiethnic culture and ancient archeological ruins or an active adventure filled with hiking, caving, zip-lining, snorkeling and more. Furthermore, in comparison with eco-tourism star and popular Costa Rica, mainland Belize is relatively undiscovered and there are many attractions in which you can have almost the entire place to yourself especially if you go when the cruise ships aren’t in port. Per the World Tourism Organization, in 2017 Belize had about 1.4 million visitors while larger more popular Costa Rica had approximately 3.2 million, and most of the tourists who come to Belize are on a cruise meaning their visit is usually only for a day. What makes Belize unique is her combination of natural wonders and archeological jewels. Given her tiny size – Belize’s mainland is about 180 miles long by up to 68 miles wide – one can easily explore a variety of Belize’s immense diversity in a week. There are five key regions: The Belize District, the Northern Cayes, Northern Belize, Cayo District and Southern Belize and you can also easily tag on a day visit to neighboring Guatemala to see the famous Mayan ruins of Tikal. There is plenty to offer yet planning your trip can be a bit daunting given all the choices. 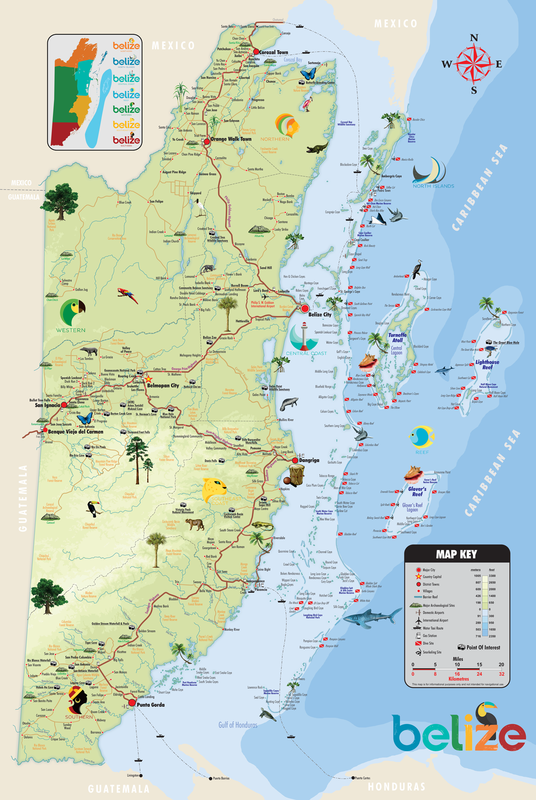 (Check out this country map of all the awesome places to visit in Belize). After an hour drive, it is time for the boat ride that will take us to the ruins. Visiting the Mayan ruins of Lamanai is quite an adventure and requires an hour long boat ride through mangroves and jungle. On top of the ruins, nothing but jungle surrounds. If you are looking to get a taste of all Belize has to offer, then it is best to spend a few days checking out each of the main highlights: The Barrier Reef, the jungle, some of the Mayan ruins, the culture, adventure and nature and of course a visit to the cayes. Belize was first put on tourist map by its extraordinary barrier reef which is the second largest barrier reef in the world (after the Great Barrier Reef in Australia) stretching over 185 miles along Belize’s coastline. The reef comprises seven key marine reserve zones, over 400 cayes and three atolls and is home to the world famous Blue Hole that drops over 400 feet into the deep blue ocean. With over 100 types of coral and 500 species of tropical fish, the reef is an underwater paradise for divers, snorkelers and anglers from around the world. One thing I love about Belize is it offers the best of both worlds: The jungle and the sea. While the crystal clear Caribbean sea graces the entire east side of the country, the mainland of Belize is covered in lush tropical jungle. About 40% of Belize’s land and sea is protected in some manner through national parks, national monuments, wildlife sanctuaries, and forest, marine and nature reserves. Belize has an estimated 570 species of birds that enjoy the labyrinth of internal rivers, lagoons and jungle forests blanketing Belize. Jaguars are popular throughout the jungle of Belize as well as pumas, ocelots, monkeys, tapirs, peccaries, and coatimundis which look similar to a raccoon. Wildlife and bird-watching trips are a popular activity within Belize’s jungle. The Maya, one of the most advanced indigenous groups of the “Mesoamerican” region (the name for Mexico and Central America countries before the Spanish Conquest in the 16th century), left behind an incredible network of archeological ruins of sacred temples, pyramids and cities throughout Belize, Mexico, Guatemala, Honduras and El Salvador. Belize was once known as the epicenter of the ancient Maya world which at its height of power in 250-900 AD had close to 2 million Mayans interspersed throughout its relatively concentrated geographical block in Mesoamerica. For over 2,000 years, the Mayan Empire excelled in agriculture, hieroglyph writing, mathematics, pottery and trade at a time when Europe was still in the Dark Age. After their decline, they left behind a massive network of ancient cities and ruins, many of which have yet to be excavated. Belize alone is home to over 900 archeological sites and hosts some extraordinarily impressive ruins including Xunantunich, Altun Ha, Caracol, Cahal Pech and Lamanai to name a few. A visit to the ruins takes you back in time to a fascinating world of a highly advanced civilization. Belize’s unique geology has blessed her with many intricate caves especially in Western Belize where the conditions for producing caves is ideal. In the eyes of the Mayas, caves were seen as a link to the underworld and their Gods thus many caves in Belize such as the famous Actun Tunichil Muknal (ATM) Cave are home to artifacts of ancient Mayan rituals and ceremonies. There are many options to explore the caves such as hiking and at time swimming in the underground ATM Cave to canoeing through the Barton Creek Cave or simply riding an inner tube down a river in and out of a few caves. It is all up to your level of adventure and comfort. But you are sure in for an adventure of a lifetime. Belize is a multicultural country with a blend of Mestizo, Maya, Garifuna, Asian and Mennonite communities. While the official language is English, Spanish, Criol (Belize Creole), Q’eqchi’ Maya, Mopan Maya, German and Garifuna are other languages that are spoken throughout Belize. For those who love culture, you will find it in the variety of food, music and art found within Belize. Even the cayes have a unique blend of island life. If you are in to island life and embrace the notion “go slow” as they say in the cayes, then you are in luck. There are over 400 cayes along Belize’s coastline with the North Islands being the more popular ones. You can spend some time at one of many resorts on the more developed Ambergris Caye or opt for the smaller, laid-back Caye Caulker both within a short boat ride to the reef. If you aren’t interested in snorkeling, another favorite pastime on the islands is simply swaying in the gentle ocean breeze in a hammock or else you can hang out at one of the many drinking spots. With so much to offer, it is hard to choose all you want to do in a week but if you do your homework before you go, you can certainly find some balance between adventure and relaxation. While I didn’t hit all the regions, I felt like I got a good understanding and taste of Belize with my itinerary that included three days each in the Belize District, the Cayo District and on Caye Caulker. I guess it largely depends on the kind of trip you desire whether it be a beach trip, snorkel/dive trip, cultural trip or a little bit of everything. For me, I always prefer a mix of adventure with culture. Thankfully G Adventures had the perfect itinerary with a little bit of wiggle room for each traveler to play around with. There are many nonstop and one stop flights from several cities in North America. Back in September, Minnesota-based Sun Country Airlines began a nonstop flight from Minneapolis-St. Paul International Airport to Belize City meaning I could get there in a little under four and a half hours of flying. While Sun Country does not offer flights every day of the week, I was able to fly nonstop to Belize City on Sun Country and fly on Delta Airlines via Atlanta on the flight back. Given the fact that Belize is on the same time zone as Minneapolis, I had no jet lag making it a very easy trip to do in a week. Belize is a relatively small country covering approximately 9,000 square miles making it similar to the size of New Hampshire. The roads are a mix between paved and gravel, and transportation is relatively cheap. Most travel is done by bus, however, there are also short flights available on small planes via Belize’s two airlines Maya Island and Tropic Air, and you can also access most of the cayes via ferry. Driving is relatively straightforward and given the small population of Belize, it is not too difficult. For excellent travel information on what to do, see and where to stay check out the Belize Tourism website at www.belizetourism.org. Very cool. That’s a bucket list item. Thanks for sharing! Glad you enjoyed! It was a fabulous trip! Belize is a place we keep saying we want to return to. We also really enjoyed our time there. We stayed in San Pedro and one of the many highlights of our stay, was a river boat journey to Lamanai. My header photo for my blog was taken at the Mask temple there. We also had quite an adventure on the boat taking hubby out to scuba dive. Very memorable. Definitely time for another visit. I loved the boat trip to Lamanai! It was so fun! We stayed at a really neat local place about an hour’s drive from where you begin the boat ride to the ruins. It was right on the river. I didn’t go to San Pedro but I’m sure it is nice. I sure loved Belize. I remember your posts on it! I would have never imagined reading the word “intrepid” in an article about Belize, but perhaps I am guilty of the same kind of stereotyping I did with Hawaii! We have such easy access to Belize from where we live, and yet we have never gotten up much enthusiasm, thinking we would mainly be on a bunch of beaches (although they do seem beautiful) or dawdling through a few more Mayan ruins. Is there really adventure there? I guess snorkeling and ziplining count, but can you be active all day there, taking long hikes or doing some serious canoeing? I’d be cool with mini-activities and beaches for a few days, but my husband is refusing to go because he thinks it seems very tame and boring. Tell me he’s wrong! The experience of four hours climbing, swimming and hiking inside this insane cave tops my list of incredible adventures even more so than Kilimanjaro. It was insane! No cameras allowed and the video doesn’t do it justice but it was absolutely nuts!!! Oh another thought as I could write on it all day. Yes there is plenty of jungle and hiking out in the middle of no where so yes adventure can be found even more so than in my opinion Costa Rica which has many more tourists. We really didn’t see hardly anyone until we got to the islands but there is a whole big mainland waiting to be discovered. I have read all your comments to my husband! We will have to give this a shot next winter! Belize sounds absolutely magical Nicole. I’ll be honest I’ve not heard of it but your photos truly bring it to life. Thanks for a wonderful share. Thanks Miriam! It is a tiny country just tucked below Mexico. It is a lovely place and with such a short flight (only 4 hours and 20 minutes non-stop) from Minneapolis, I’d love to go again sometime! Hope you are doing well! Wonderful! And yes, I’m well, thanks Nicole. How’s your husband and his back? What a stunning place! Your beautiful photos make me want to go there. Belize sounds incredible. Not a country I’ve thought about before. I’ve used G Adventures a couple of times now (including last month to summit Mt Kilimanjaro) and like them. The local teams that work for them seem to think they’re a good company too. Oh how cool! I can’t wait for you to write all about your trip! How was it? I think G Adventures is great. I really enjoyed traveling with them. Wow congratulations!!! I can’t wait to hear more about it. I loved it too. Now not sure what to do next! Great article! And I love love the pictures. Belize is blessed. So lucky to live here! Thanks so much! I LOVE Belize. I want to go back as there are a lot more areas I want to explore. Hope to bring my family.